QwertyTown, a web-based application that teaches keyboarding, digital literacy and online communication skills, has relaunched as version 2.0 with all new and updated lessons, games, teacher and admin tools, as well as a completely redesigned website. QwertyTown 2.0 was rebuilt from the ground-up in HTML5, making it compatible on Chromebooks, tablets, PCs, Macs and other devices. The student, teacher and admin dashboards have been reimagined and feature an intuitive design. The relaunch occurred for a few reasons, namely due to the company’s expanded user base over the last two years, according to QwertyTown CEO Paul Garofano, who co-founded Second Nature Learning with David Grammerstorf. The company now serves more than 250,000 K–12 students and teachers worldwide, which called for “a more robust platform,” he said in an interview. Version 2.0 is easy to implement in classrooms as well. It uses Clever to auto-integrate with most student information systems, assisting teachers in managing and keeping class rosters up-to-date. The updated version also features new administrative tools that make it easy to manage student progress. 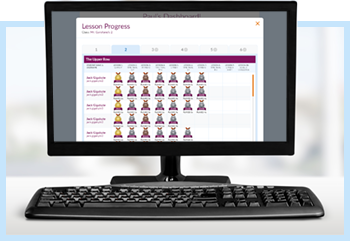 Teachers and parents can, for example, customize performance benchmarks in lessons and level challenges. They receive detailed data reports that can be viewed online or downloaded. To learn more, watch the video below or visit the QwertyTown site.